"Into the Woods" is a safer, simpler adaptation of Stephen Sondheim’s seminal musical, but Rob Marshall’s family-friendly film is still a fun and moving musical with strong performances. Stephen Sondheim and James Lapine’s Into the Woods is a brilliant musical; it’s a two-and-a-half-hour beast that weaves together classic fairy tales and questions the notion of happily ever after. The first act consists of familiar fairy tales—Cinderella, Rapunzel, Little Red Riding Hood, and Jack and the Beanstalk—along with a new one: a witch has cursed a baker and his wife so that the two are unable to have a child; the baker and his wife then fetch a series of items for the witch in order to lift the curse. By the end of act I, these characters have all reached their happily ever after. Sondheim begins act II with an ensemble song centered on the lyric, “I never thought we could be so happy.” On the final syllable of “happy,” Sondheim has the cast sing in harmony, but leaves the chord tonally ambiguous: the chord the cast lands on contains neither a major not minor third, yielding an empty, emotionally uneasy effect. With this musical ambiguity, Sondheim indicates that these are stories where happily ever after isn’t an endpoint, it’s something that is fleeting. As act II continues, the play becomes an absurdist deconstruction of what came before it—the play’s narrator is consumed by a giant, charming princes are nothing more than womanizing frat-boys, and central characters are killed on stage. Rob Marshall’s Into the Woods leaves the play’s first act mostly intact, but chops the second act—including all occurrences of “I never thought we could be so happy”—yielding a lighter but sleeker adaptation of the classic musical. Into the Woods begins exactly as the play does, with Cinderella (Anna Kendrick), the Witch (Meryl Streep), the Baker (James Corden) and his wife (Emily Blunt) carrying out their respective fairytales. The opening musical number is an ensemble song and serves to introduce us to the central characters. This is the sort of thing that’s easier to stage than film: on stage, unrelated characters can appear beside each other, united by the music; in film, no obvious parallel exists. Rob Marshall’s experience with movie musicals (Chicago, Nine) comes in handy, uniting the characters through the power of editing, but somehow managing to keep the sequence focused. Never does it feel like Marshall is simply cutting to another scene because the singer changes; Marshall’s ability to competently film a movie musical—which is a task that Oscar-winning directors have failed in spectacular fashion—allows the strong source material to speak for itself. When the film reaches its second act, it seems that Marshall and screenwriter James Lapine—who also wrote the book for the musical—aren’t sure what to do. This is a Disney film, after all, and having a narrator sacrificed to a giant seems a bit too left-of-center, and the film features a half-assed take on the deconstructionist second act of the play. The musical sequences remain the strongest moments—Streep’s performance of “Last Midnight” is powerful, both dramatically and vocally—and the attempts to salvage the more out-there sequences (deaths are implied, rather than shown) fall flat. The way that Marshall and Lapine have dealt with heavier material is a tad on the comical side, bringing the film from winking satire into camp territory. In the grand scheme of things, this isn’t much of an issue: who doesn’t like their movie musicals with a bit of camp? Marshall and Lapine didn’t let Into the Woods become a super-serious movie, and have created an environment where their failures are still fun to watch, due to the light tone, consistently fantastic song score, and the strength of the central performances. As Cinderella, Anna Kendrick is put to perfect use. Her vocals in Pitch Perfect have been compared to that of a Disney princess, so Cinderella falls firmly into her comfort zone. Her wide-eyed yet wise-beyond-her-years Cinderella combines the Grimm’s fairytale version of Cinderella with Sondheim and Lapine’s version quite well, but it’s her singing ability that makes her stand out of the crowd. She sounds exactly how you’d expect Cinderella to sing, while still making her character perfectly pity-able. James Corden and Emily Blunt are both charming as The Baker and his wife; the two have great on-screen chemistry, and manage to convey a true sense of love and respect between the two central characters. 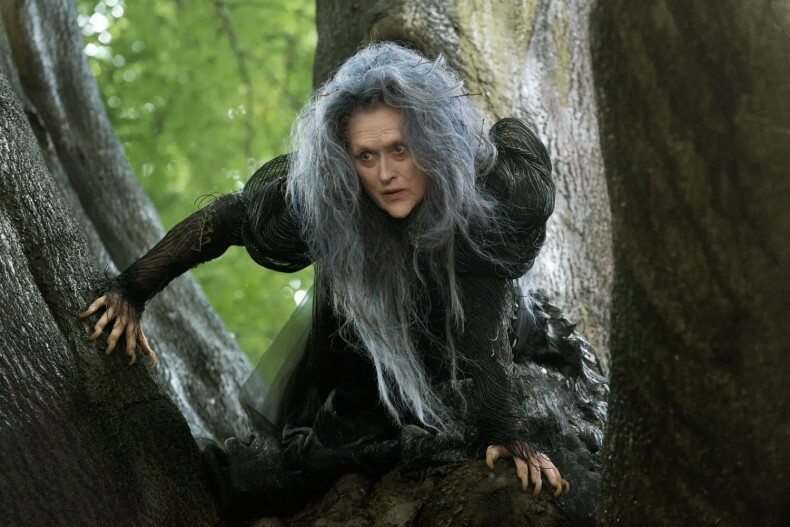 Despite these three fantastic performances, Streep is the real star of Into the Woods. Despite frequently being listed as the greatest film actress of all time, Streep still manages to surprise as the Witch in Into the Woods. The Witch is a challenging role that switches between villain, voice of reason, and overbearing mother, but Streep steps up to the plate and effortlessly knocks it out of the park. Mamma Mia showed us that Streep was a semi-competent singer, but Into the Woods shows Streep emerging in full diva form with a powerful voice to match her dramatic expertise. Into the Woods is a musical that I have a lot of affection for, and Rob Marshall’s straightforward, highly competent take on the play is neither revelatory nor essential, but it’s a great time nonetheless. If I were a different sort of critic, I’d say that Into the Woods is like a household cat: neutered and declawed, but still fun to have around. It’s not a great film, and fans of the musical may not be as forgiving of Marshall’s axing of the more memorable moments, but it’s certainly an entertaining experience that can serve as an introduction to the musical for the uninitiated. This is a thoroughly enjoyable movie, in which Rob Marshall and his cast accomplished exactly what they set out to do. “Life After Beth” is a funny, if uneven, zom-rom-com that only explores a fraction of its limitless potential, wasting a horribly misused cast in the process.